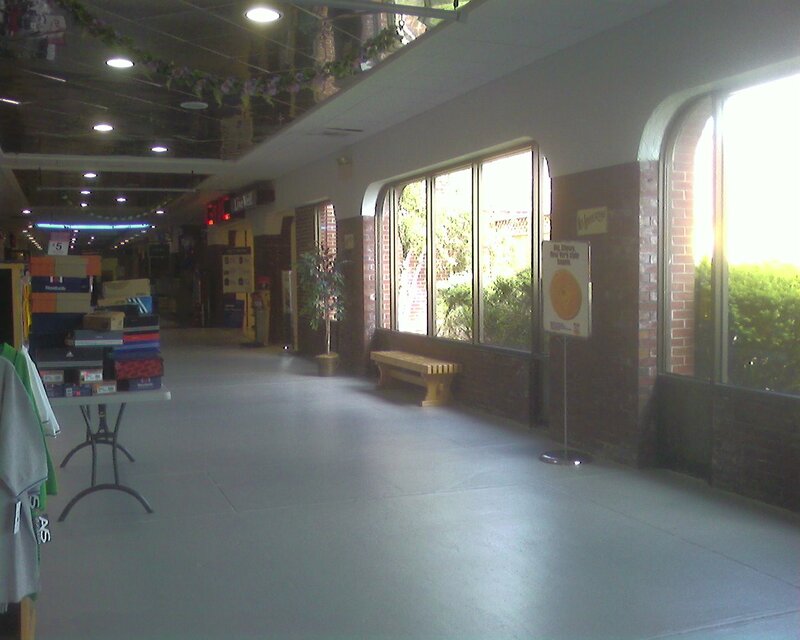 At Labelscar, we love tiny malls. Maybe it’s because there’s a thrill in hunting them; they’re stealthy and low-profile, hard to catch and rarely documented on the internet. 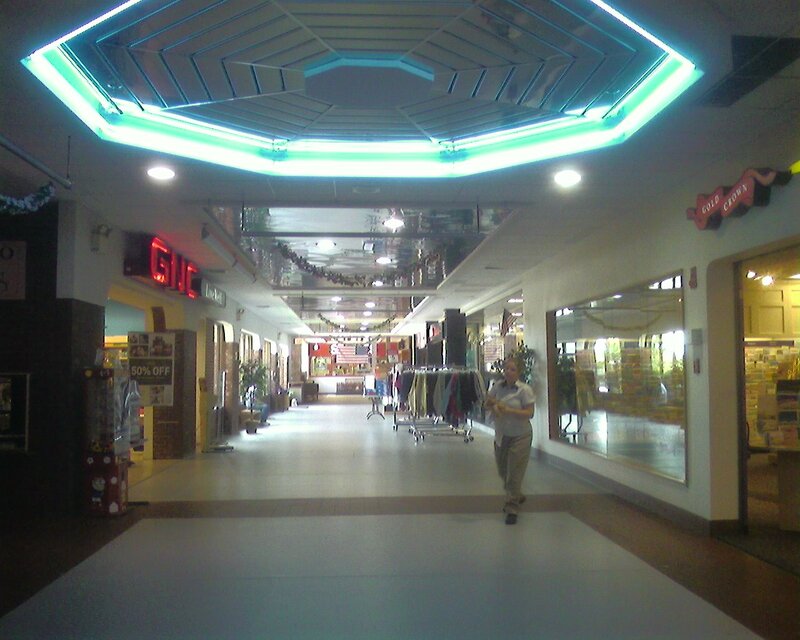 The International Council of Shopping Centers generally ignores them. They’re fun little surprises, and some of them go undetected by us for years even in well-worn territories. 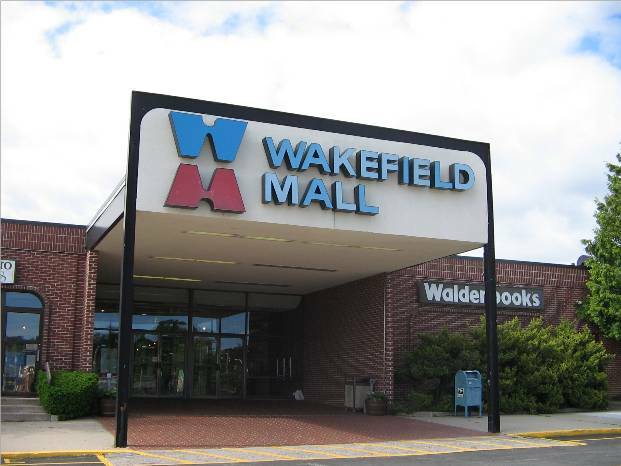 The Wakefield Mall is a bit different because it’s in my home state, which is also really tiny. What a perfect pair! 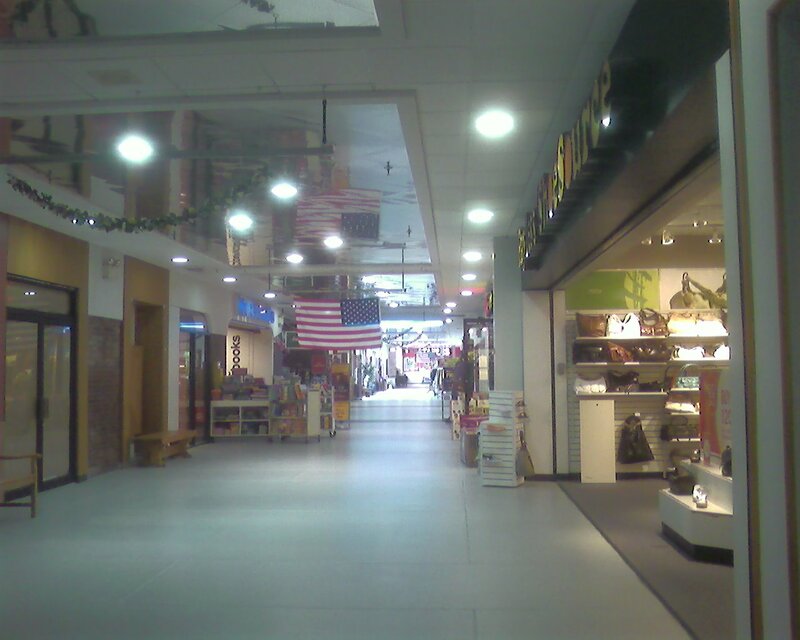 Wakefield Mall is a really tiny–under 200,000 square feet by some measure–enclosed mall in southern Rhode Island. But more interesting than its size is the sheer awesomeness of that logo and facade! Located in the middle of the suburban shopping district of Wakefield, itself just a village located in the larger town of South Kingstown, this aging and tiny center serves the upmarket farthest-south Providence suburbs. If you want to say serving, anyway. 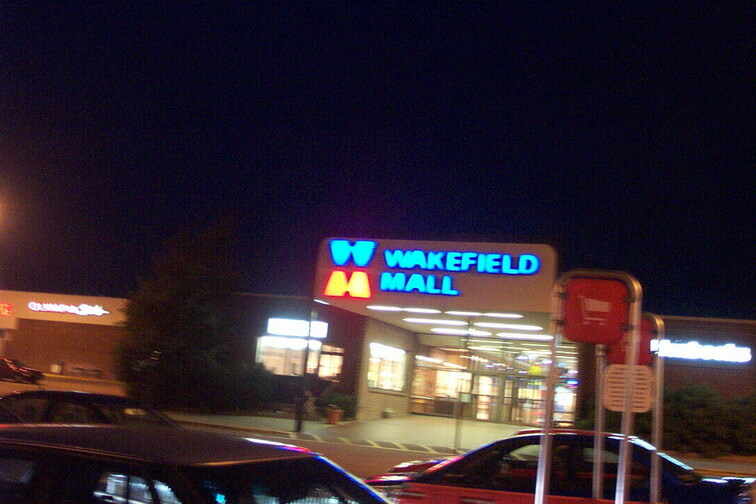 The Wakefield Mall is one of the smallest traditional enclosed malls I’ve visited, with only 15 stores or so. 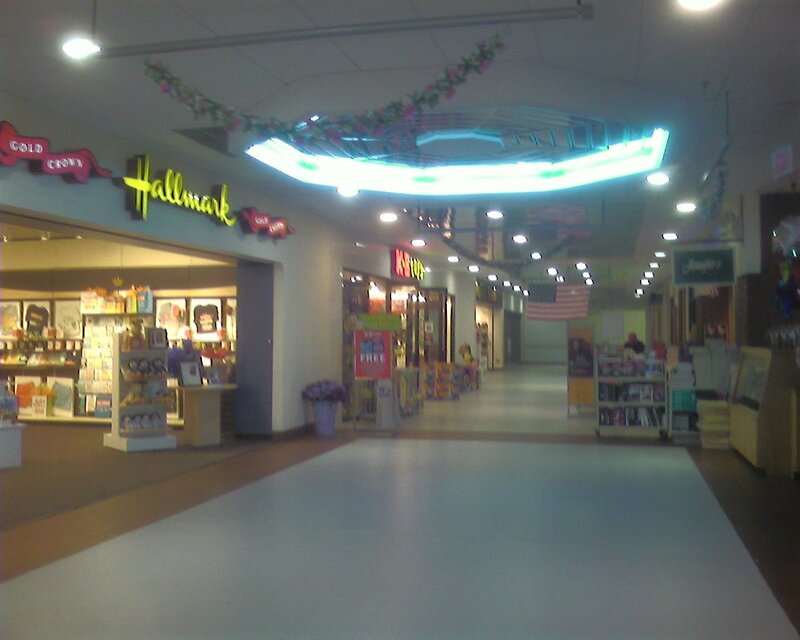 Years ago, the mall was anchored by NHD (a hardware chain that was acquired by Ace Hardware in the mid-late 1990s) and a rather large and modern Woolworth store (it had the blue logo scheme if that is at all indicative of its vintage). The Woolworth closed several years before the remainder of the chain and became a Rich’s Department Store (not the Georgia kind, the New England kind: they were more in the Wal-Mart vein). That was short-lived; it closed in 1996 or 1997. 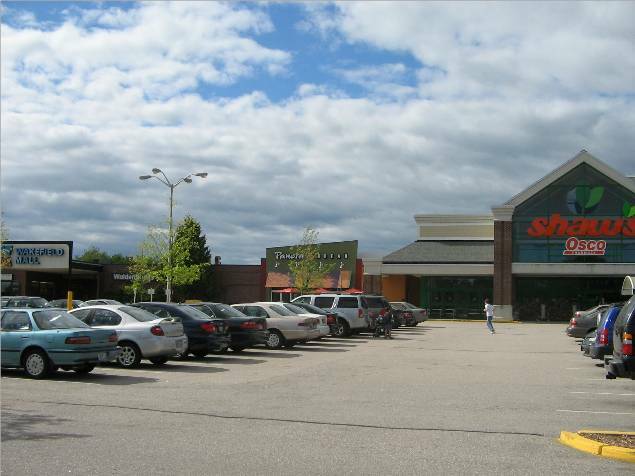 The space was then drastically re-worked and its mall entrance was removed to create room for a modern Shaw’s Supermarket. 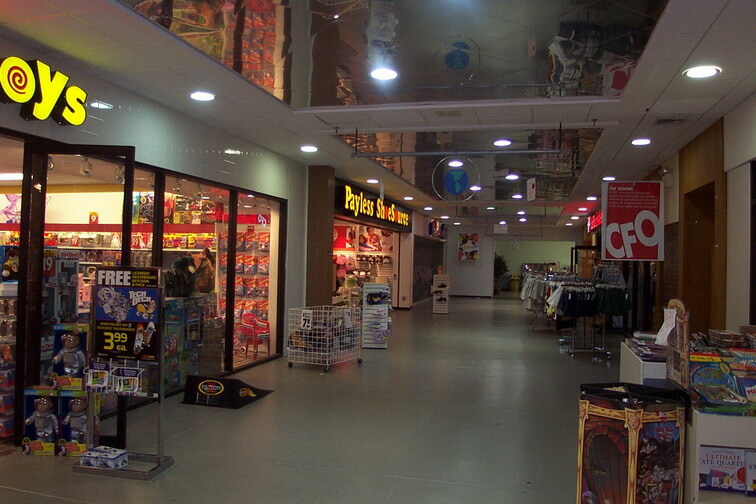 The NHD (which may or may not have stayed in the mall long enough to ever be bannered as Rocky’s Ace Hardware) would become a Staples sometime in the late 1990s or early 2000s. Staples also removed their mall access. 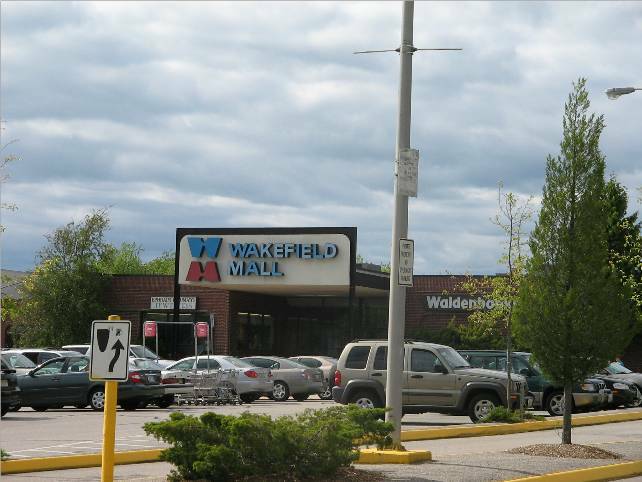 Despite being unfairly shunned by both anchors, the tiny Wakefield Mall holds its own, with a near 100% occupancy rate. 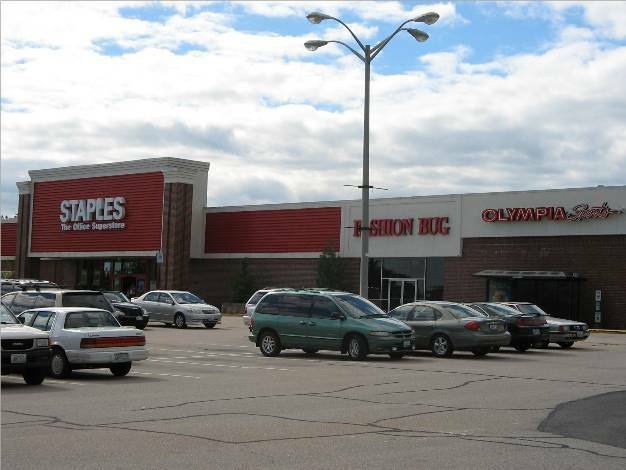 Long-time tenants include Fashion Bug, FYE, Waldenbooks, Hallmark, a local jeweler, KB Toys, and Olympia Sports. At various points, the mall hosted a relatively small Cherry & Webb store, Poore Simon’s, Weathervane, and (as reported by Deadmalls Dot Com) a Papa Gino’s location that closed ages ago. 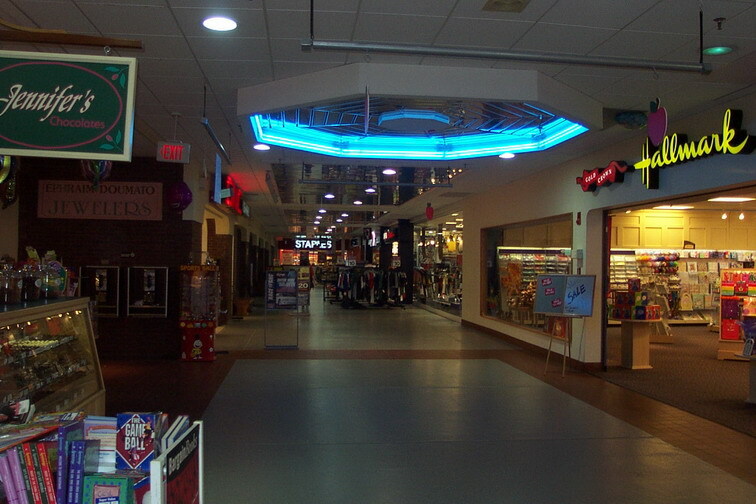 The Wakefield Mall is incredibly small and dated, and the kind of mall that would’ve generally been big-boxed. It’s probably survived because it is located in a popular suburban area that’s been growing and is a popular tourist destination. South Kingstown is also the home of the University of Rhode Island, so there’s a constant supply of young people moving in and out of the area. These photos are all from June 2006. 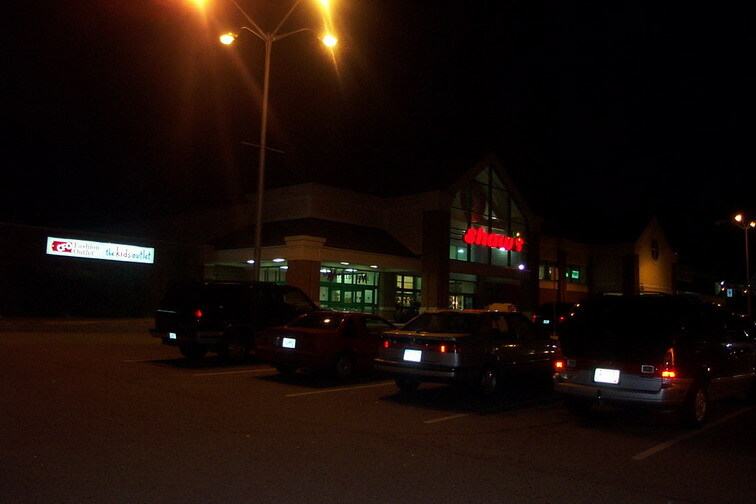 Prangeway: Here are some photos I took of Wakefield Mall the night of August 23, 2001. The mall hasn’t changed much at all since then; however, I thought the mall’s classroom motif advertisement was hilarious. 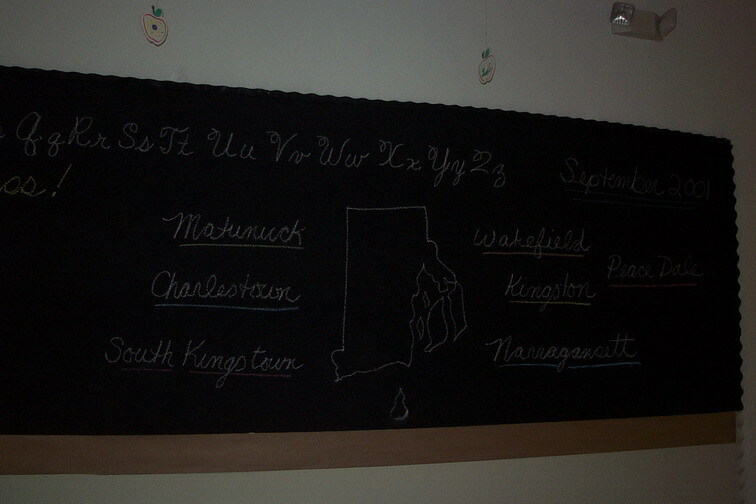 Not only were the cursive letters of the alphabet written in chalk at the top with “Good morning class!” scrawled underneath in chalk, but the mall’s 15 stores were used in a “Spelling List” and a geography lesson, complete with a chalk outline of the state of Rhode Island, featured the towns in the mall’s immediate area. It was great. Wakefield Mall is dreadfully static, but now there is a Panera in the space left vacant by Catalog Fashion Outlet. Seems possible that the opening of Marshalls in Narraganset was the undoing of CFO. Panera is a floor-through, so can be accessed both from the parking lot as well as the mall’s interior. 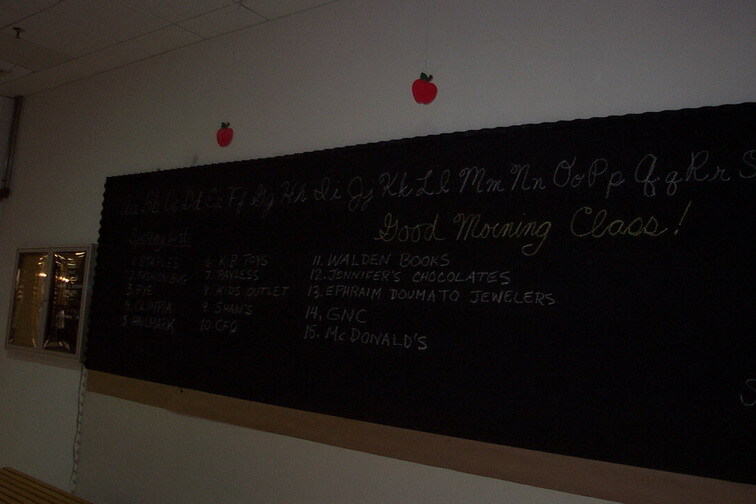 I thought the chalkboard advertisement was pretty hilarious too. Too bad the mall doesn’t have a fitness center, because then there would also be phys ed in the curriculum. I recall the Wakefield Mall of the 80’s when I was employed at the Chess King as an assistant manager. While I have changed dramatically from those “hair raising” days, it is nice to know that little else has! I remember eating at the Woolworth’s cafe and buying my drinks from the CVS that was directly across from CK! 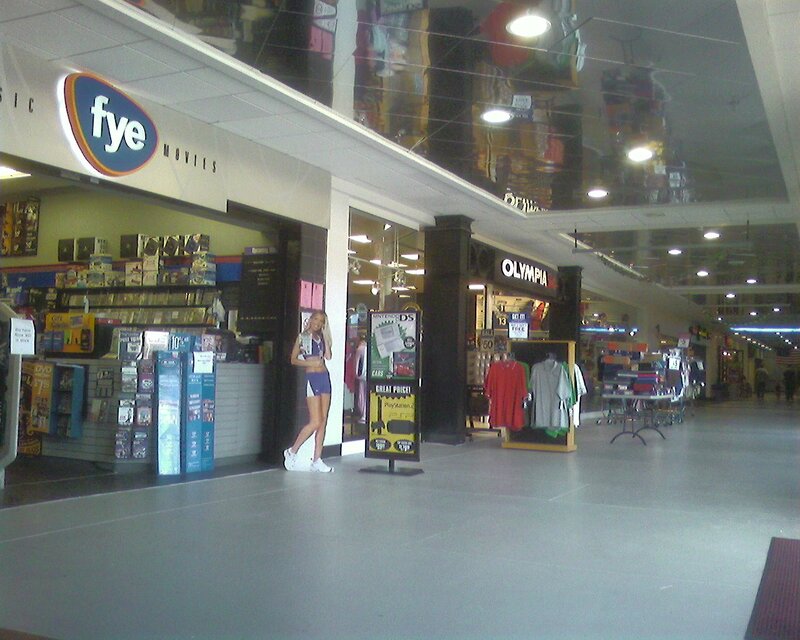 Stores I remember from Wakefield Mall from when I was a kid (80’s) that are no longer there, and aren’t mentioned here or on the deadmalls.com site: Fayva (shoe store), Donnelly’s (men’s clothes), and So-Fro Fabrics. Really love these small malls. I have only been able to find info here and at deadmalls.com. The photos are great. Deadmalls.com left we wondering what the mall looks like. URI isn’t precisely in South Kingstown. It’s 10 minutes down the road in Kingston 🙂 But, lots of students do live in the area. I love that hideous logo. I’m 30 and can’t remember a time before it existed. It always amazed me how that tiny, tiny Waldenbooks has thrived, but you have to go to Warwick to get to B&N or Borders. A 25 minute drive either way, and in Rhode Island that might as well be a trek across the Sahara…better to settle for one of the, I don’t know, 3 books they have in stock at Walden’s.